A boy has been sent out of lessons for not having the right trousers, but his mother said they are not supplied in his size. 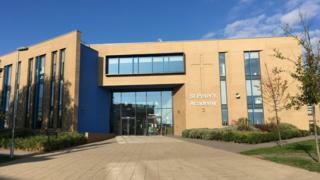 A number of pupils were put in isolation at St Peter's Academy, Stoke-on-Trent, as their trousers did not have purple piping. Joshua Burton, 15, was one, but his mother said they were told his measurements would have to be ordered. The principal said its supplier has offered to alter trousers. Jane Burton, mother of the year 11 student, said he needs a pair with a 30in waist and 34in leg, but has to wait four to six weeks for them to arrive. The 44-year-old from Eaton Park said it was noticed by a teacher in Joshua's first class on Wednesday, and despite explaining, was told he would have to go into isolation. Principal Michael Astley said: "The uniform shop has several different cuts for boys and girls, but if there is a student where the uniform is not appropriate the uniform shop is advising the parent on where to purchase trousers and are then adapting them free of charge." He said there are still 10 pupils who are not adhering to the uniform policy. Mrs Burton said Joshua has now returned to his classes: "He will be wearing the plain black trousers until the new ones arrive, but I have taken the purple piping off his old blazer and stitched that on." The cost of buying the branded shirt, blazer, jumper, tie and the trousers for boys for the school is £73.17, according to BBC calculations from prices on the shop's website.